Producer: Cerveza Artesana Ecologica Luna. Description: Cream crown cap. 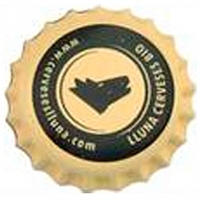 Black logo and circle with green text: WWW.cerveseslluna.com, LUNA CERVEZAS BIO.